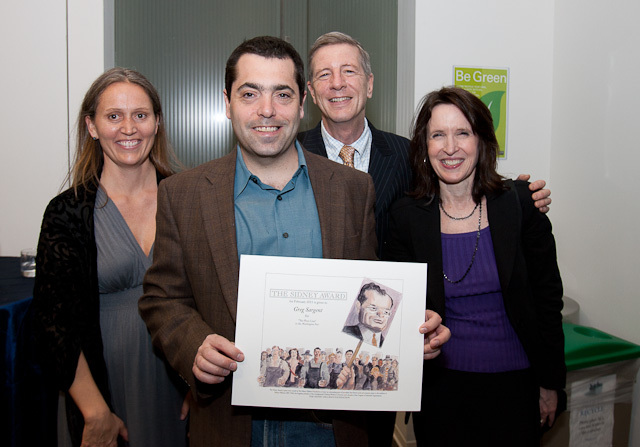 NEW YORK: The Sidney Hillman Foundation announced today that Washington Post blogger Greg Sargent has won the February Sidney Award for his extraordinary reporting about the Republican assault on public sector employees in Wisconsin. Sargent is the author of “The Plum Line” at washingtonpost.com. His comprehensive coverage of the protests ranged from reporting on the latest polls–“68 percent of independents [in Wisconsin] want Governor Walker to compromise”–to getting the conservative Cato Institute to admit that an ad produced by Karl Rove’s PAC had completely distorted Cato’s statistics. Sargent, who is 43, is a former reporter for The New York Observer and a former columnist for New York magazine. After a short stint at The American Prospect, he spent two years working with Josh Marshall at Talking Points Memo, where he covered his first presidential campaign in 2008, which “turned out to be the most thrilling and historic campaign in decades,” Sargent said. Sargent started writing “The Plum Line” at the beginning of 2009 for “Who Runs Gov,” a Washington Post-owned website. At the beginning of 2010, Washington Post editorial editor Fred Hiatt moved Sargent’s blog to the online opinion section of the Post. Sargent lives outside Washington, D.C. with his wife, Rachel Waugh, and their son Robbie. What was it like covering the protests in Wisconsin? This has been one of the most exciting stories to blog about in years. The constant twists and turns in the story made it perfectly suited to the medium of reported blogging. The sudden emergence of a huge national audience that was emotionally invested in the cause of public employee unions, the protesters, and the Dems who went on the lam – even as some traditional political commentators were relatively slow to recognize the story’s national importance – made for a compelling drama that at first unfolded for the national audience almost entirely online. The intense engagement from readers across the country, and their hunger for even trivial or obscure tidbits of news about the tale, made it doubly rewarding to track every new development the saga had to offer. Did anything surprise you over the course of the past few weeks? What was most surprising about this story was the public’s unexpected support for public employee unions and the Dems who fled the state on their behalf. It had long been assumed by many commentators that Republican governors would find an easy target in public employees as they sought to balance budgets, and conservatives assumed it would be easy to scapegoat them amid our economic woes. Yet poll after poll after poll showed the opposite to be the case: Majorities have simply been unwilling to accept the idea that public employee unions should lose their right to collectively bargain or that they should cease to exist. While this was undoubtedly a function of Wisconsin Governor Scott Walker’s uniquely draconian proposal – and while it’s true that other GOP governors are likely to have some success with their own anti-union proposals – the public response to Wisconsin stands as a reminder that public opinion can surprise us in heartening ways. How did coverage of the events play into what was happening on the ground? The explosion of national online interest in the story, and the intense focus on it from blogs, news web sites and social media, had a direct impact on events. The Democrats who were on the lam followed events via Twitter. National liberal groups raised huge amounts of money from online audiences for the fugitive Dems, and continue to do so now for the drive that’s underway to recall GOP state senators. This symbiosis is likely to continue. Because the national media has largely lost interest in the story now that Governor Walker has temporarily won the standoff, the continuing enagement in it online from liberals and Dems across the country will be crucial to maintaining momentum for the recall drives. This story is anything but over, and while grassroots organizers on the ground and the people of Wisconsin deserve the credit for keeping it going, the relentless, ongoing online coverage is undoubtedly a key factor.